As part of Forum for Alternative Belfast's 2011 summer school week Senada Demirovic Habibija spoke about post-conflict Mostar in Bosnia and Herzegovina. Senada is currently the Senior Advisor for Urban Planning with the City of Mostar. Mostar is located to the south of Bosnia and Herzegovina on the Neretva River and is the largest city in the Herzegovina Region. Senada began her presentation with a brief overview of the city’s history which shed light on how the old town area came to become such a rich multicultural cluster of architectural features. The city of Mostar can trace its roots back to the Roman period with evidence found during archaeological digs. The medieval period is less well documented and little is known of this period in the city’s history. It wasn’t until the Ottoman period that Mostar began to grow considerably as an urban settlement in the 15th and 16th century. 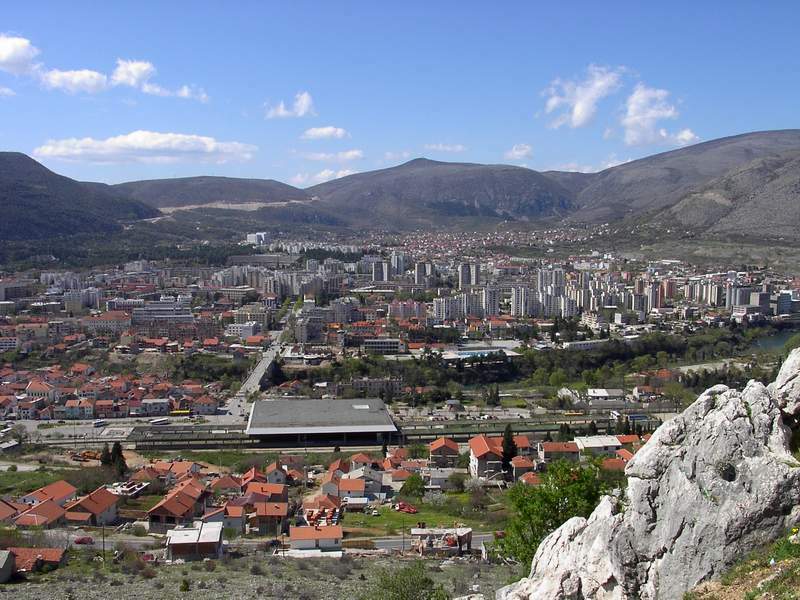 Panorama of Mostar in 2006. The Ottoman settlement developed with a distinct oriental urban form which divided the town into two areas. Senada explained that at the centre of the settlement was the Carsija area - home to the crafts and commercial uses (a public / civic area) – whilst the outer areas would be for private residential use (Mahalas). 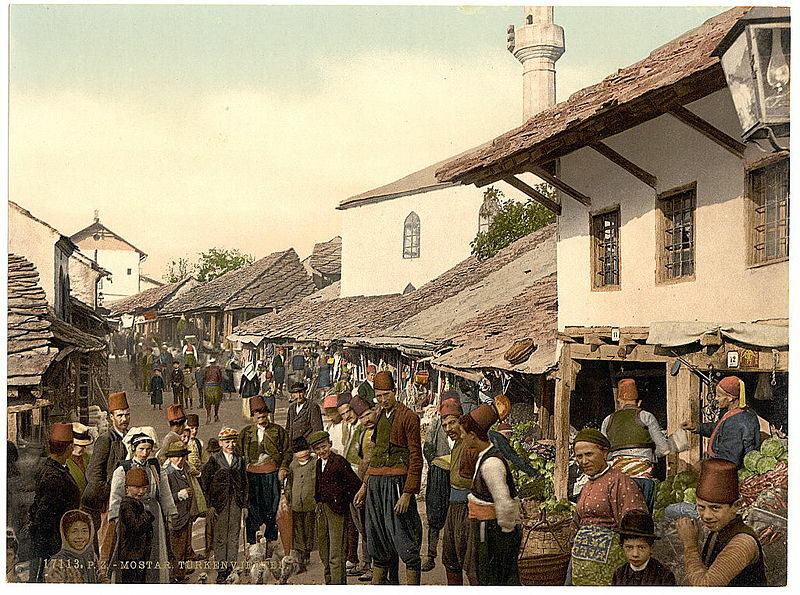 During this period the city began to develop its multi cultural identity as the Ottomans expected religious toleration amongst the Muslims, Christians and Jews of Mostar. Moving into the Austro-Hungarian period of 1878 – 1918 the two distinct urban zones were combined and the urban form of Mostar changed significantly. Buildings now provided ground floor public uses and the upper floors were occupied by residents. The public and private realms of the settlement were now inter-woven to create a more vibrant and active urban place. The ground floor commercial / public use and upper floor private / residential use continues to this day explained Senada. Meanwhile, as the population of the city expanded, so too did the architectural offering of Mostar. The Austro-Hungarian administration had high aspirations for Mostar and new monolithic neo-renaissance buildings were appearing throughout the settlement (in sharp contrast to the architectural styles that had gone before). Continuing into the 20th century Senada explained how buildings then introduced elements of Art Nouveau and Secessionist. Also during the 20th century the city population jumped from 18,000 in 1945 to 100,000 in 1974. Due to significant economic growth and a large rise in the skilled population Mostar constructed large residential areas to the west of the River. The city leaders also focused on the reconstruction and conservation of the historic old town area. 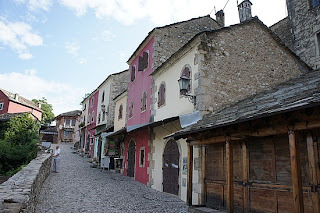 The recognition by the administration of the historic and cultural value the old town had to offer provided a sizeable tourism market for Mostar. This was officially recognised by the Aga Khan Award for Architecture in 1986. 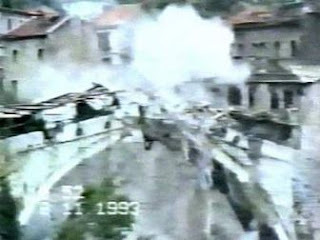 Stari Most - the 16th century Ottoman footbridge that had been a symbol of Bosnian multi-centralism for over 400 years - was shelled at point-blank range by a Croatian tank, until the icon of Mostar finally collapsed into the Neretva River on the morning of November 9th 1993. Stari Most about to collapse. From www.mbc.edu. The "Old Bridge", also referred to as “Mostar Bridge” was designed by Ottoman Architect Mimar Hayruddin and completed in 1566 after nine years of construction. At 30 meters long, 4 meters wide and 20 meters high the bridge was extremely advanced for the time period. Two fortified towers were added to each end of the bridge in the 17th century - the Halebija Tower on the right bank and the Tara Tower on the left bank. The bridge stood for 429 years until it was destroyed in 1993. A temporary structure was constructed after the war by the British Royal Engineers but a more permanent replacement came in the form of a reconstructed replica financed through international financial aid managed by the World Bank in 2002. Stari Most during reconstruction. By Donar Reiskoffer. Following the war reconstruction with the help of international aid began almost immediately according to Senada. Although the city had a deeper scar that could not be rebuilt with bricks and mortar… Historically, Mostar was one of the most cosmopolitan cities of former Yugoslavia, containing a very mixed and intermingled population. During the war approximately 30,000 people were expelled from the city in which Senada remembers mixed marriages being commonplace. Despite post-war attempts to revive the multi cultural city (Bosnia and Herzegovina was declared by the Dayton Agreements (1995) a multinational state and Mostar was highlighted as one of the few mixed Bosnian municipalities) the urban space of the city is not shared by the differing communities post war. Senada explained that the city is now fragmented and polarised by the two biggest national groups – Croats and Muslims. Providing an example of this Senada explained how she remembers studying together with students from all religious backgrounds – now the same high school has different classes depending upon the religion of the student. The reconstructed Stari Most. By 'gsummerville7' on flickr.com. Already the similarities between Mostar and Belfast are striking – Once prosperous and ambitious cities set back by conflict. Neither city has managed to return to pre war levels of economic success, tourism potential or civic unity. It was suggested at Senada’s presentation that in Belfast we have had a dysfunctional city for so long that we have become used to the fragmented nature of our urban spaces and communities. Whilst there is a large section of the population who will remember pre conflict Belfast there is an even greater population who will not have experienced the city of pre-troubles Northern Ireland. 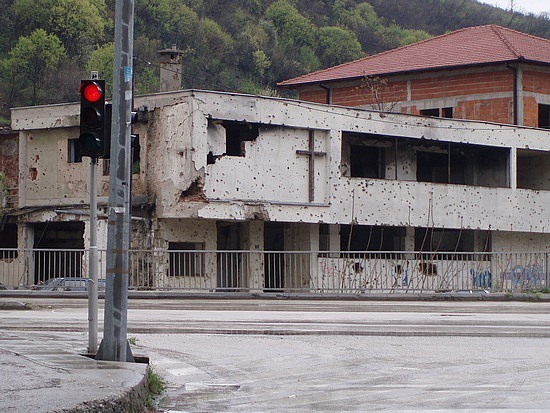 In Mostar however the conflict came about relatively quickly and was over within a few years. A considerably larger proportion of the population of Mostar will remember – as Senada does – a functional city with a diverse cultural mix and a mixed religious community. “In 10 years we went to division” claimed Senada. Poor transport, a lack of public space and overcrowding are some of the most discussed threats to a city, but perhaps a greater threat with a more devastating and lasting impact is religion and multi-nationalism. 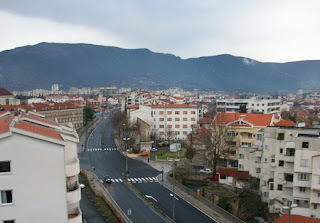 The lasting impact on Mostar and Belfast has still to be overcome and successful urban spaces in both cities have become dysfunctional barriers. How can we successfully and fully rebuild the physical and social elements of our urban spaces in a post conflict city? 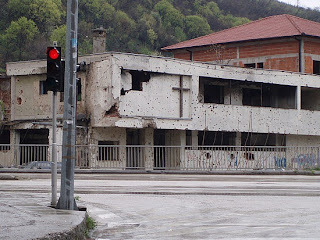 A war damaged Religious building in Mostar. From blog.travelpod.com. Since the end of the war Mostar has focused on a $15m restoration program which largely focused on the old town area and ‘Old Bridge’. Between 1994 and 2004 when the bridge re-opened Mostar held a series of workshops as part of the Mostar 2004 program. The first Mostar 2004 Pilot Workshop was held in August 1994 by the IRCICA as part of a long-term project undertaken by IRCICA in cooperation with worldwide academic and cultural institutions. In ten years over 500 people from 25 countries have taken part in the project which aims to support future reconstruction and urban preservation activities in Bosnia and Herzegovina. The first workshop drew up a “plan of action, an urban restoration plan and methodology of reconstruction” with a vision of completing the ‘Old Bridge’ in 2004. The workshops began to set out a vision for restoring Bosnia's multicultural heritage alongside the physical reconstruction “through a three-phase process designed to engage the participation of an international community of architectural professionals, educators, historians and students together with their Bosnians counterparts”. Mostar's reconstructed 'Old Town' area. From blog.travelpod.com. Through a workshop almost identical to the Forum for Alternative Belfast summer school a group of agencies participants from more than twenty-five universities came together to consider, in a number of teams, areas such as historical research, computer aided design, methodology, urban restoration design, economics, informatics technology, education and individual building designs. Resource experts from around the world presented thirty-three lectures on Mostar's architectural heritage and a variety of related subjects. Field trips were organized to towns which exemplified similar architectural patterns and the workshop ended with final review sessions by a jury comprising a group of architects, planners, and civil servants from the Government of Bosnia and Herzegovina, UNESCO, the World Monuments Fund, the Aga Khan Award for Architecture, the Aga Khan Trust for Culture, universities and other institutions. Whilst on a larger scale to the FAB summer school the process is remarkably similar. Based on one of FAB’s key concepts – collaboration – the Mostar 2004 program brought together many different disciplines, cultures, skill levels and engaged with professionals, government and the community. Is this the way forward for post-conflict cities? The Bulevar Hrvatskih Branitelja (mentioned above) is a boulevard type road that runs alongside the river in Mostar. 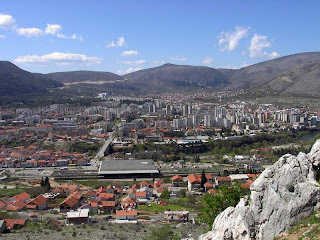 Often referred to as the ‘Bulevar’ it was the ‘frontline’ during the war between the Croatian and Bosniak forces in Mostar. The 'Bulevar' in Mostar. By 'alex maiutton' on flickr.com. The 'Bulevar' in Mostar post war. Perhaps Belfast and Mostar have the potential to share and learn in our search for a shared city without barriers. The proposed southern section of the Inner Ring Road. This year the FAB summer school sought to put forward a solution that could reconnect inner south Belfast with the city centre after roads infrastructure left a damaging barrier effect. Meanwhile Mostar seeks to reconnect the east and west of the city due to an equally damaging ‘barrier’ road. As we seek to rectify the mistakes of past infrastructure projects and Mostar looks to re-connect the city’s former ‘front-line’ there is a lot of experience to be learnt from each other. Mostar and Belfast as post conflict cities possess an urban fabric and infrastructure that, when combined with parallel educational and cultural institutions, serve to consolidate the division of the city. Both must find a collaborative way forward that deals with these divisions in the city and look to create shared spaces and connected infrastructure to return our cities to successful, attractive and vibrant urban places.